Scouts are the third section in the Scouting Movement and are usually aged between 10 1/2 and 14 years old. For more information please contact the webmaster. Our Scouts have a weekly meeting of 1 1/2 hour duration. They take part in district events such as chess and Draughts tournament, Crossw Country, St Georges Day activity, laser quest competition, city hike, week long County camp during the summer holidays and annual group camp/hike. 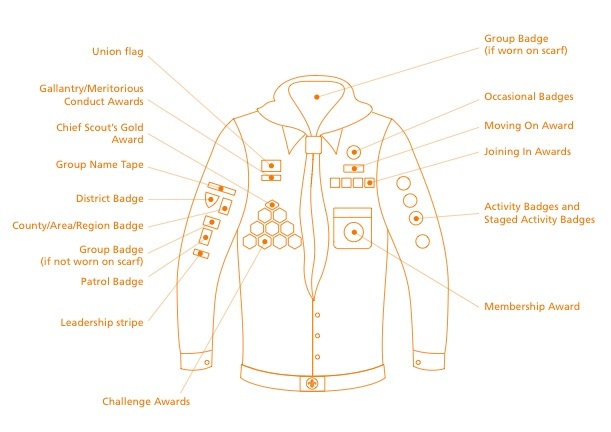 For details of the badges available for Scouts to earn and their requirements, please follow this link: Scouts Badges. For anyone unsure of which badges should be sewn where, please see the image below.